Niagara Falls NY - Employee volunteers from Keybank clean up the courtyard at Community Missions as part of Keybanks 28th Annual Neighbors Make The Difference Day. (BUFFALO) - May 22, 2018 – On Wednesday May 23 from 1:00 p.m. until 4:00 p.m., KeyBank will host its 28th annual Neighbors Make the Difference Day. More than 700 KeyBank employees in Buffalo and Western New York will spend the day volunteering with more than two dozen community organizations and service projects, including the William-Emslie YMCA in Buffalo, The Boys & Girls Club of Northern Chautauqua County in Dunkirk and Community Missions in Niagara Falls. 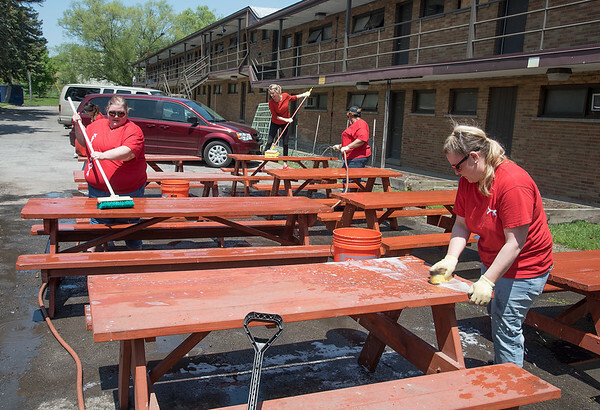 They will join nearly 7,000 KeyBank employees nationwide in receiving paid time off to volunteer at more than 850 projects in the neighborhoods where they live and work. A list of projects taking place in Buffalo and WNY can be found at the end of this release. This year, KeyBank expects employees will volunteer more than 2,200 hours at various locations in WNY on Neighbors Make the Difference Day. Several of the bank’s branches will close at noon on May 23 to accommodate employee volunteers; customers will have access to ATMs, as well as online and mobile banking. In 2017, nearly 7,000 Key employees volunteered across the country at close to 900 non-profit agencies, committing a total of 28,000 hours to community organizations and projects. Neighbors Make the Difference Day launched in 1991, with a group of KeyBank employees in Alaska who volunteered for service projects. By 1993, KeyBank extended the concept to many of the communities it served, making it an official day of employee volunteerism. Now, Neighbors Make the Difference Day is a hallmark program and leading corporate volunteerism effort in America, showcasing KeyBank’s commitment to communities. To participate in the social media conversation on May 23, follow #NeighborsDay and #IAmKey, @KeyBank on Twitter and KeyBank on Facebook at http://www.facebook.com/keybank. For more information about KeyBank’s commitment to transformative philanthropy and volunteerism, visit http://www.key.com/philanthropy.